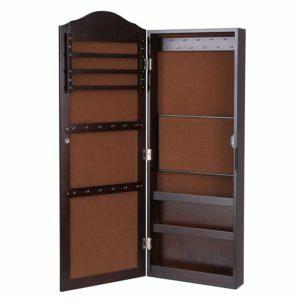 Trying to find a great wall mount jewelry armoire for storing your jewelry, makeup, and other important possessions? In this article, we’re going to talk a little bit about different types of armoires and organizer cabinets, as well as go over our experts’ top 8 picks for the best wall mounted jewelry cabinet of 2018. How Does a Wall Mount Jewelry Armoire Work? Are Wall Mount Jewelry Armoires Safe & Secure? Wall Mount Jewelry Armoire: Best of 2018? Tired of searching everywhere for that necklace you want to wear? Maybe you’re constantly looking for lost earrings? Or perhaps, you simply want a more central spot to organize and store your nicest jewelry. No matter what your reason for seeking out a new organizer cabinet, we’re here to help. That’s why we’ve put together this in-depth and comprehensive look at 8 of the best wall mounted jewelry cabinets on the market right now, as well as a little more information about the history and widespread use of armoire cabinets. So sit back, take a sip of your wine, and read on to discover our experts’ top picks for the best wall mount jewelry armoire currently available on the market. When you’re investing in a jewelry organizer to store your more valuable belongings, you want to make sure that you’re getting a quality piece of furniture that will securely fasten to your wall and last for many years to come. With its attractive European design, the BTExpert Premium Wooden Wall Mount Jewelry Armoire Cabinet takes the top spot on our list. 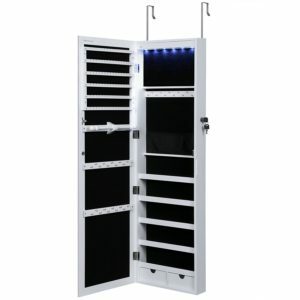 Available in three colors, black, white, and cherry, this BTExpert jewelry cabinet is equipped with a locking door safety feature, a full-length front mirror, and interior shelves that are hand-lined with velvet. 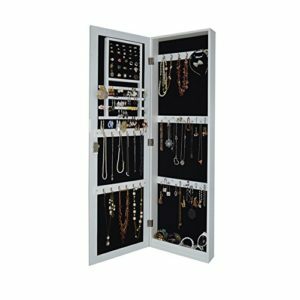 Designed to provide plenty of space to store and organize all of your jewelry, the BTExpert jewelry organizer is 48” high by 15” wide by 4” deep. On the interior there are four shelves, sixteen compartments, two drawers, a rod, and a pouch to provide a wide array of different storage spots. 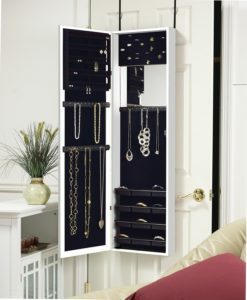 A great pick for anyone seeking the best all-around jewelry organizer, you can’t really go wrong with this stunning yet practical piece from BTExpert. Another high-quality organizer cabinet, the SONGMICS Lockable Wall Mounted Jewelry Armoire is dual-functioning: it can either be mounted directly onto your wall or secured to a door for a less permanent installation. If you’re looking for space, this armoire has it: it boasts 32 hooks for necklace, 48 holes for earrings, 90 additional earring slots, and a number of other convenient storage areas. The internal shelves of the SONGMICS wall mount armoire are lined in velvet, and the door comes with a secure locking mechanism. Unless some of the other armoires that place lower on our list, the SONGMICS Wall Mounted Jewelry Cabinet comes fully assembled and ready to hang directly out of the box. The dimensions on this piece measure 47 ¼” high by 14 1/8” wide by 3 5/8” deep. Searching for a truly unique, majestic jewelry armoire? Look no further than this attractive and well-constructed piece of furniture, the Southern Enterprises Wall Mount Jewelry Armoire Organizer. Boasting a full-length beveled front mirror and a wood construction that utilizes durable Chinese oak, this is the perfect organizer cabinet for any home with a dark or wood-themed décor. Measuring in at 43” high by 14 ½” wide by 4 ¼” deep, this jewelry armoire from Southern Enterprises is great in smaller spaces. Its interior is lined with a plush black felt, and there are 38 hooks, 30 notches, and 8 cushioned ring holders for storing all of your accessories. The door of the Southern Enterprises wall mounted jewelry organizer also locks for added security. Made by the same manufacturer as the #2 armoire on our list, the fourth spot belongs to the SONGMICS Wall Mounted Jewelry Armoire. Unlike its more extravagant counterpart, this value-priced cabinet is ideal for the buyer searching for a more basic place to store their valuables. While the price may be much lower, however, the construction and build is still top notch. Coming in at 37 ¾” high by 13 7/8” wide by 3 5/8” deep, this SONGMICS armoire is one of the most compact units to make our list. Constructed out of engineered MDF wood and lined on the inside with a soft brown felt, the SONGMICS Wall Mounted Jewelry Cabinet contains a full-length mirror, 56 notches, 23 hooks, 3 shelves, and a 66-ring storage compartment. The Plaza Astoria Wall Mount Jewelry Armoire Cabinet is a modern, reasonably priced jewelry organizer that is triple function: not only can be it mounted on the wall or hung on your door, but it also comes available with an optional floor stand for maximum flexibility and portability. Designed to hold 36 necklaces, 48 earrings, and 96 rings, the Plaza Astoria jewelry armoire measures 48” high by 14” wide by 4.2” deep. Unlike the majority of the units on our list, many of which are made throughout the Far East and China, Plaza Astoria manufactures their armoires right here in the United States. 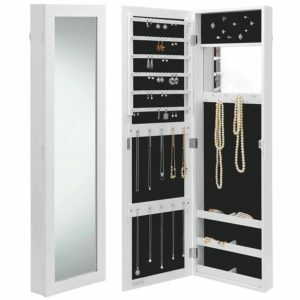 In search of a reasonably priced jewelry armoire with a locking door and sizable storage capacity? 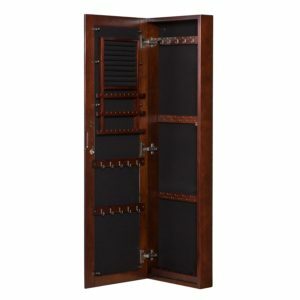 You may want to stop and take a closer look at the Organizedlife Locking Wall Mounted Jewelry Armoire. 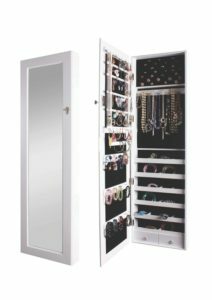 Featuring dimensions of 48” high by 14.6” wide by 3.7” deep, the Organizedlife jewelry cabinet is large enough to hold 91 rings, 42 necklaces or bracelets, and 36 sets of earrings. Constructed out of an engineered MDF wood and finished in a glossy white appearance, this armoire is a stylish choice for any light-colored room. Some light assembly is required on this unit, but it does come with door brackets which allow it to be mounted to doors up to 1.75” in thickness. 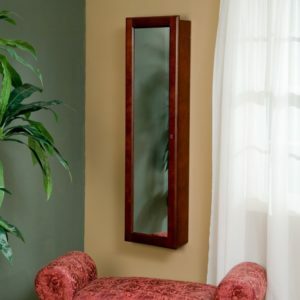 The only armoire cabinet on our list to feature both external and internal mirrors, the Beautify Mirrored Wall Mount Jewelry Armoire is a smart choice for anyone who typically does their makeup standing up in front of a mirror. Measuring in at 43.3” high by 12.4” wide by 3.5” deep, this compact organizer is built to hold up to 44 rings and 72 pairs of earrings. It also has three extra shelves, as well as 17 additional hooks. Ready to be mounted directly to your wall or hung on your door, the velvet lined Beautify jewelry cabinet is secured with a magnetized door clasp to keep the door from accidently swing opening in between use. While not as secure as the locking-type doors, the strong magnetic clasp is more than sufficient for typical use. Easily the largest organizer cabinet on our list, the Finley Home Locking Wall Mounted Jewelry Armoire Organizer comes in at a whopping 50” high by 14 ½” wide by 4 ¾” deep. Not for the shopper who is looking to save as much space as possible, the Finley Home armoire is a smart buy for the people who has a lot of jewelry and other belongs to store and organize. Featuring a full-length front mirror, the Finley Home jewelry cabinet comes in your choice of five different colors: black, white, espresso, cherry, and oak. It offers the most options of any of the armoires on our list, making it a great versatile cabinet for any décor. Although it’s priced slightly higher than some of our other picks, the Finley Home wall mount jewelry armoire is well worth the extra cost if you’re in the market for an oversized organizer cabinet. The origins of the armoire dates back nearly 700 years, to the 14th century. Back then, houses didn’t have the closets and cupboards that we have today – not even sprawling castles and estates. 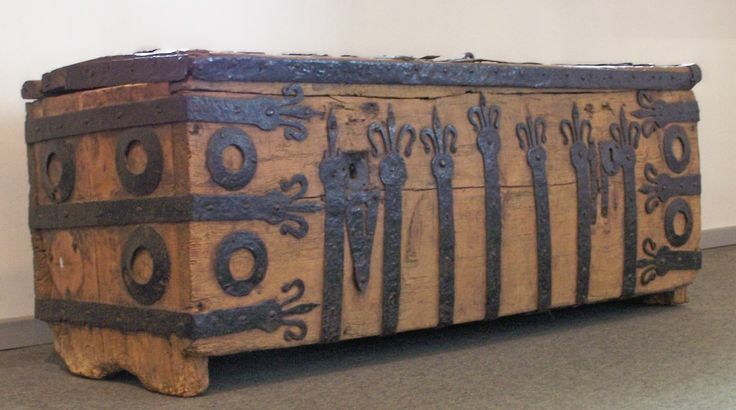 Instead just about everything was stored in traditional-style chests. Over time, however, the need for a more practical storage solution gave birth to the armoire – originally a place for well-to-do noblemen to store them finest clothes and belongings. Armoires stayed within the realm of the wealthy for hundreds of years until the 1700’s and 1800’s when they’re popularity spread throughout Europe and to North America. By then, armoires had transformed into a variety of different storage devices, with different styles of them holding everything from jewelry to clothes to fine ceramic China. Today, there are a ton of types of armoires – one of the most common in modern homes is the entertainment center used to store televisions, DVRs, video game systems, and other common household electronic equipment. For the practical storage of jewelry, however, the wall mount jewelry organizer is always a popular choice. In the old days, armoires were giant. There would often take up entire walls and be used to store everything from gold and jewels to clothes to food to even weaponry. Wall mount jewelry armoires, on the other hand, are much smaller and specifically designed with the intention of storing tiny, precious items like rings, necklaces, and other pieces of jewelry. Apart from being constructed with small drawers and spots to securely store your most valuable possessions, a wall mount jewelry armoire is typically a popular choice because of how much room it saves. Being mounted on the wall means freeing up valuable floor space, and the thin, slim-profile build of most jewelry organizers mean that it will likely blend in with your wall rather than be another piece of bulky furniture taking up your home. Unlike traditional armoires which sit directly on the floor, wall mounted jewelry cabinets are raised up and bolted directly into your wall with long screws. Once it’s securely fastened into the wood studs in your wall you can then load it up with all of the jewelry, makeup, and other small items that you wear on a daily basis. 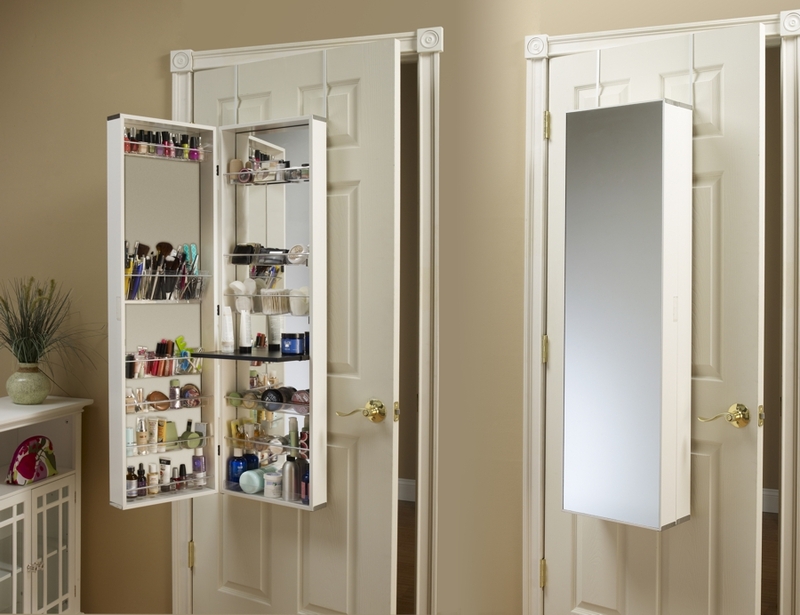 Many of the modern wall mount jewelry armoires come with built in mirrors perfect for checking out different looks, as well as for applying makeup. When they’re installed properly, yes, wall mounted jewelry armoires are positively a secure way to store your belongings. When mounting your armoire, however, it’s important that the screws bolting it into the wall are sunk into the wood studs behind your drywall – not just the drywall by itself. While some lightweight items can be screwed right into soft drywall, the weight of a quality-constructed armoire, especially when it’s filled with your possessions, will likely be too heavy and you’ll risk it falling. When screwed into studs, however, our experts here at Respectable Reviews feel there should be little to no reason for concern. As far as being a safe place to store your jewelry, even the best locking armoires aren’t going to be able to prevent theft in the case of a break-in. If that’s your primary concern, for valuable jewelry that you’re worried about leaving out in the relative open, you may want to consider investing a more secure home safe or even a safety deposit box at your local bank.